There’s nothing like having a new mouth to feed around the old home front. At our residence, the newest is a baby bird that fell from its nest, much to its mother’s dismay. We tried! We really did try putting it back in its nest, only to watch it leap back to the ground. Being really honest, my wife had me laddering this rascal into a hump-teen dozen nests trying to find one it would stay in. All the while being dive-bombed by an angry mom who didn’t understand. Not only that, if you don’t respond fast enough, he escapes and off through the house he goes screeching and… pooping! …so that he can screech some more of course. This entry was posted in WordPosts and tagged Belostomatidae, Bird, Christianity, faith, family, fathers day, home, Infant, Mother, Parenting. Bookmark the permalink. 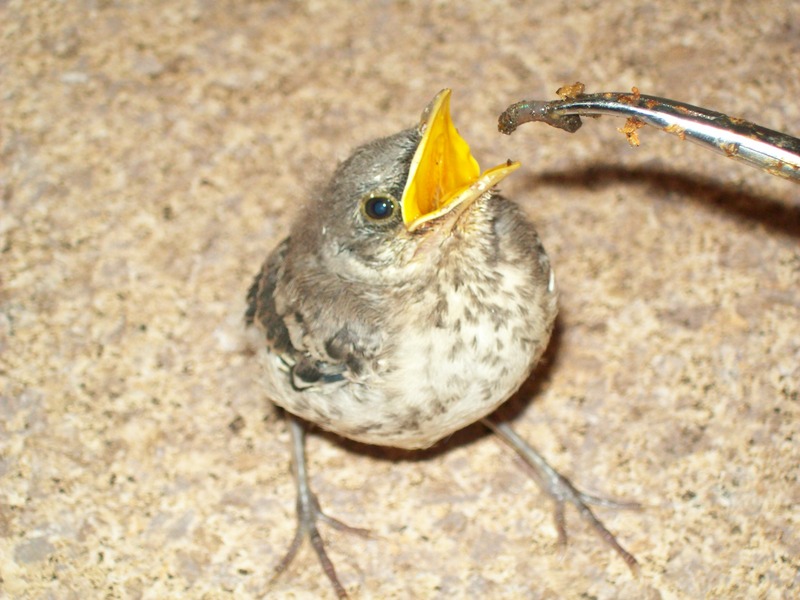 We should desire our spiritual food as earnestly as your little bird. You’re so tweet to take care of the little lost baby and not saying “that’s for the birds”….and a feather in your cap for giving us a bird’s eye view of longing for nourishment!! I’m glad u r so tender hearted!